The RMS Titanic is the cover story of the National Geographic this month (it made the cover of last month's Smithsonian, too -- centennials will often prompt coincidences like that). 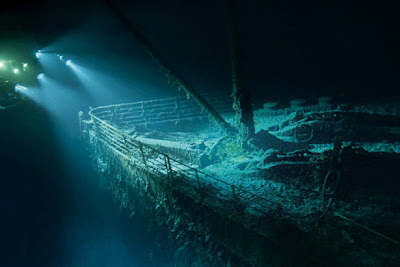 [D]id anybody see those pictures of the Titanic in National Geographic this month? I was struck by the pile of deck chairs visible on one section of the ship, looking for all the world to have not been re-arranged in any way. Gosh, I wish I was clever enough to have come up with that one, but credit is due to one Wilhelm Arcturus. I read her the comment -- and she didn't think it funny at all. "That's an expression you use," she said. "I never say that." Bee won't be impressed with me. Well, it's OK, because I'm not impressed with Blogger. I was trying to put up a new list of old posts in the Sidebar -- seasonal stuff, the U.S. baseball season having officially begun today, albeit in Japan. Now, having recommended a report to Blogger Support or Blogger Help, one might think that there would be some email or other means of reporting the problem. At most one is invited to join a group -- another group! -- and have random people (some of whom may be as ignorant as me -- or even more ignorant -- I kind of hope, actually, that this may be possible) venture their suggestions. I suspect that the real problem is that Blogger is rolling out a new interface. I've seen reference to this on my other blogs that you don't know about. I've not seen it here because I never did adopt the then-new and now-to-be-abandoned format for this blog. Baseball is life. The rest is details. It wasn't until I was writing the teaser to yesterday's post that I figured out why the kids' recent weekend visits have been so tiring. Years ago, when the kids allegedly lived with us, there was one place that none of them would ever voluntarily be on a Saturday night: Our den. From the time the kids entered junior high until they signed a lease elsewhere, Long Suffering Spouse and I had the den to ourselves on Saturday nights. If someone was home -- whether because of a disciplinary matter (theirs or someone else's) or because of some other social disaster -- that someone would be in his or her room, brooding (or, in later years, talking on his or her cell phone or chatting on line), or in the basement, taking out his or her disappointment on the Playstation. I could, and did, get a lot of sleep on Saturday nights. If there was a sporting event on TV which might draw one of the boys from their room, I could doze off without embarrassment. Indeed, it would probably come as a relief to the kid in question who might otherwise have to engage in some sort of limited conversation with me. Long Suffering Spouse would do stitchery on Saturday evenings, or grade papers and -- sometimes -- after I had already dropped off -- snooze a bit herself. Even before all the kids were driving, and we had to fetch and carry them to and from their social engagements, there would be a few hours in between drop off and retrieval in which I could watch TV through the back of my eyelids. The weekends were a time for rest and relaxation. Oldest Son and his wife Abby came by with their itsy-bitsy dog Rodent and there was a renewal of the Canine Summit, this one a bit more successful than the first such meeting last November in that Abby was much more confident on this occasion that Cork would not eat Rodent in one bite (though he could) -- but not entirely successful in that Rodent was not so easily persuaded that she was not in mortal peril. Middle Son had stopped by the house in the middle of the afternoon, on his way home from work. He's an accountant; it's tax season. Saturday is a working day. He was hoping to pick up his mail (we remain his post office box) on his way home. His original plan was to go home for a nap and a shower before heading out for the fleshpots of Lakeview and Lincoln Park. Older Daughter, however, persuaded him to stay. Only Youngest Son -- still in college -- was unavailable. So... maybe Long Suffering Spouse and I weren't the main attraction. The kids enjoyed each others' company and the canine confrontation. But neither Long Suffering Spouse nor I could get in our accustomed Saturday evening snooze. Small wonder these weekends with kids visiting are not as restful as weekends heretofore. Yes, I was tired yesterday morning, but it was because I had to play Gracious Host all weekend, not because I'm getting older. It's gettin' to be the end of March and I still have work undone from January. Part of it is the move within the Undisclosed Location to the Teeny Tiny Law Office. Part of it is the parade of domestic crises (find and read the "family way" posts, if you're really curious). We're supposed to be empty nesters, but we have more people at home recently on weekend nights than we've had since the kids began to drive. The cop saw it all. He was approaching a busy intersection in the city and the light controlling his direction of travel had just changed from green to yellow. The cop was the third car in line. In a lightning calculation that was the product of both instinct and experience, the cop decided that he had no beef if the first car in line entered the intersection. He had just concluded that he probably would have also let the second car, a minivan, get through without pulling it over when he realized the first car was stopping, just as the Rules of the Road require. The minivan almost rear-ended the first car. After successfully screeching to a halt, the woman driving the van began honking. The cop could see her gesticulating urgently in the direction of the first car, finishing with the two-handed, one-finger Freeway Salute. It was a nice spring day, and the cop's windows were down. The windows were down in the minivan, too, and the gentle spring zephyr was sullied by the woman's shrieking profanities. That was enough for the cop. He flipped on his lights and intercom and told the woman to step out of the car with her hands clearly visible. A couple of hours later, back at the station, a crestfallen police officer apologized to the woman as he let her go. "I saw the bumper stickers on your van," he said, "the one that said 'Choose LIFE,' and the one that said, 'Follow Me to Church,' and the other one that said, 'What Would Jesus Do?' And I saw your little metal Christian Fish symbol, too. And then I saw what you did and heard what you said and I thought you must have stolen that van. "I'm sorry to say I was mistaken." One of the things I don't generally talk about here at Second Effort is *whispering* s-e-x. Yes, I'm old-fashioned: I still believe there are some things that should remain... private. I saw a female anchorperson on one of the local stations blush her way through a report about "coregasms." Apparently, some women find a real happy place doing exercise routines -- not pole-dancing, or anything involving batteries. Women in ordinary sweats, thinking about nothing more romantic than what to fix for dinner or who has a dentist's appointment on Saturday have found, in the course of a vigorous workout, that -- all of a sudden -- oh my! The link in this sentence, to a March 20, 2012 story on the ABC News website, by Susan Donaldson James, explains that researchers at Indiana University have scientifically established that, for many women, exercise can result in, um, satisfaction. Long Suffering Spouse wasn't in the room when I first heard the story, and I didn't say anything about it then. But, then, yesterday, on my way home from an afternoon appointment, I heard a radio interview with Dr. Debby Herbenick, one of the authors of the IU study. I mentioned it to Long Suffering Spouse last night after dinner. "No, wait," I said. I went online and quickly found several articles, sniggering and non-sniggering, about the topic generally and about the IU study in particular. I read excerpts to my spouse. She listened in silence for awhile. Eventually she said, "I thought you don't like doing exercise." "Well, no," I admitted. "But I, er, um, thought you might find this interesting." Proudly unfurled -- the Internet's own flag! This is the one concept that everyone online subscribes to, right? We're getting weather here that we don't ordinarily get until June or July. Today is "the city's 8th consecutive record high in a string that began back on March 14 when the mercury peaked at a historic 81 degrees. Today's also marks the city's 7th 80 degree day this March, far more than the month's previous record of two recorded in 1986." In fact, says this WGN Weather Blog entry, this warm streak would be noteworthy in April because the most 80 degree days ever registered in a Chicago April is eight -- and we might get that eighth 80 degree day tomorrow. This puts the long-time native Chicagoan on the edge of a nervous breakdown. Kids and newbies may be happy, but the person who has lived in Chicago, as I have, for several decades knows that there will be a price to pay. Is that pessimism... or just experience? I'm looking for that funnel cloud... or wall of water... New Madrid Fault anyone? The weather can't be blamed for the projected abysmal turnout; we're in the midst of record-setting warmth here. Actually, if I hadn't read that it's been cold in Las Vegas, Los Angeles (even San Diego), and even Phoenix, I'd be on my knees seeking Al Gore's forgiveness. Six years ago I wrote how the Curmudgeon family brought rain to Phoenix (and snow to Scottsdale). The only place we could get warm was in the rented van -- we drove around aimlessly -- and a lot -- on that trip. We wore almost all the clothes we brought with us almost all the time. Meanwhile, back in Chicago, it was sunny and beautiful and unseasonably warm. Oldest Son came up from college to throw a party at our home in our absence (I found out years later) -- a warm-up for the St. Patrick's Day Parade. So our current amazing weather streak is not unprecedented, but this is the longest such stretch in my lifetime, surely. And, still, election authorities say we won't get more than 25% turnout for the primaries today. You would think that the mere opportunity to vote, which people all over the world die for every day, would provide more than sufficient motivation. But -- the pundits tell us -- there are no "exciting" races on the Democratic ballot in Cook County. And the Republicans are still trying to choose their tallest midget to oppose President Obama. Each Republican presidential hopeful has passionate supporters -- well, each one except Romney -- but these are few and widely scattered. But 11 Circuit Court judges will be presumptively elected today in Cook County. And six justices of our Appellate Court as well -- no Republican has filed to oppose the winners. There will be a contest in November for the Cook County seat on the Illinois Supreme Court, but the Republican hopeful is already given virtually no chance. As a lawyer, the outcome of these races was "exciting" enough for me to get to the polls this morning. But three of four voters won't bother. The mystic chords of memory, that once sounded from every battlefield and patriot grave, to every living heart and hearthstone, the memory of our own national struggle for freedom and to keep freedom -- these chords are drowned out by static, by Kardashians and "reality" TV, and shouting heads on cable "news" shows; the mystic chords that bound us to common nationhood and purpose are heard by fewer and fewer. And soon? They may be audible no more. Pray for America. And, if you're in Illinois today, vote. 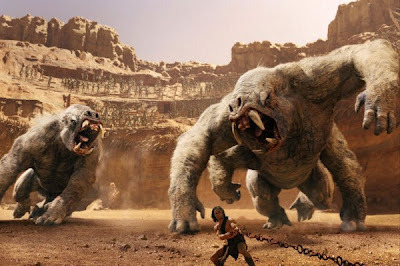 John Carter had a 55% falloff this weekend from its already disappointing opening. It'll start disappearing soon, if it isn't already gone from your local mega-movie-multiplex. If it by some chance remains at your local theater, however, I would encourage you to see it. John Carter claims to be based on Edgar Rice Burroughs' A Princess of Mars -- and it is, sort of, in a very loose sort of way. It has been updated. The beautiful Dejah Thoris, Princess of Helium, is not so helpless as she was in Burroughs' novel; indeed, she's something of a Barsoomian career girl and warrior queen here. In 1912, it was adequate for Captain John Carter to be overcome by mysterious gas in an Arizona cave or (later) stand, arms outstretched in the night in supplication, facing mysterious Mars, and be transported there by the power of his longing. The new movie provides a MacGuffin instead -- and an alien race of bad guys, neither Barsoomian nor Terran -- around whom a satisfying sequel or two might well be built. Or might have been built. If you've re-read Burroughs recently in anticipation of seeing the movie, you may be disappointed: The plot departs wildly from the original. But I didn't find that objectionable. The names of the characters, tribes and cities are the same, and their characterizations (Dejah Thoris' martial skills notwithstanding) are not jarringly inconsistent with the source material, despite the new plot. I think the movie faithful to Burroughs, despite the modernizing touches, unlike, for example, the recent Robert Downey, Jr. Sherlock Holmes-channeling-James-Bond movies. One key departure from the book -- but one I knew was more or less required: The beautiful Princess of Helium now wears more than jewelry. But the real flaw of John Carter is the marketing -- starting with the name of the picture. Does "John Carter" conjure visions of a mysterious dying world and exotic inhabitants struggling for survival? Is "John Carter" the name that sci-fi writers down to the present day have used when citing or alluding to Burroughs' Mars stories? And what idiot came up with the idea of making the trailer look like a Western? Worse, a Western with a Marvel-Comics-type-superhero-riddled-with-angst lead? Somebody must have gotten this brainwave watching the commercials for Cowboys and Aliens -- and never thought to change a thing after that movie bombed. There was too much backstory to suit me -- but I enjoyed John Carter anyway. But she enjoyed it, too. Forbes has a great piece online now by Alex Knapp, "Five Leadership Lessons From James T. 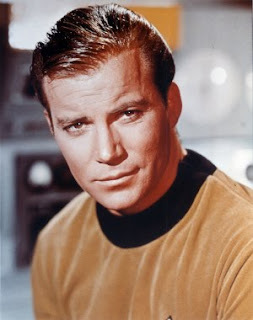 Kirk." If you read the article, I think you will be as easily persuaded as I was that Mr. Knapp, the Forbes social media editor, is well-versed in the Star Trek canon. The best part is now I find out that all those hours and hours I spent near-memorizing those old shows was putting me on the cutting edge of business philosophy. I think I should almost qualify for an honorary MBA just for this alone. This probably puts Captain Picard in line for a PhD. I saw this on Facebook this morning; I am unable to identify the original artist. If anyone knows, please advise so that I can give proper attribution. I'm here this morning in the Teeny Tiny Law Office trying hard not to think about the beautiful weather outside. 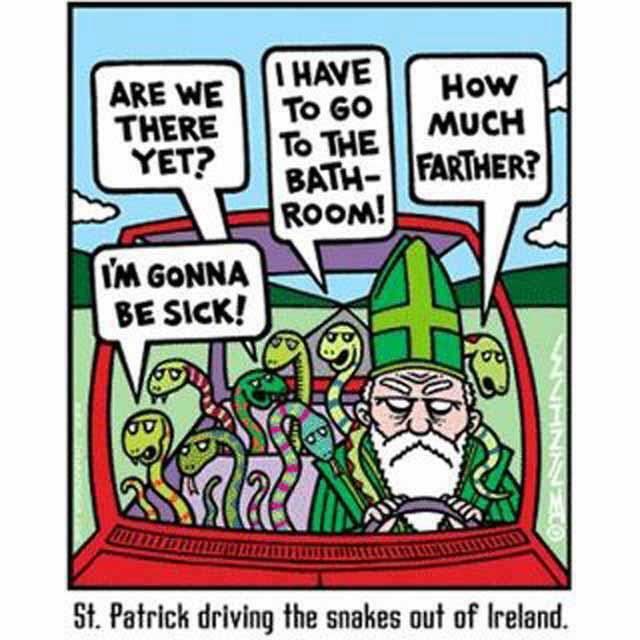 There have been a couple of St. Patrick's Days in my recollection that have been as nice -- but never as many gorgeous days strung together this early in the season. Anyway, I'm listening to the old songs on the iPod, weeping unashamedly (well, there's no one else here today) at the sadder songs, singing along with (or at least drumming a bit on the keyboard at) the lively tunes. 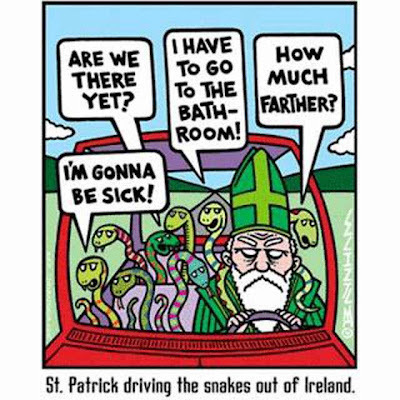 For me, it's a wonderful thing to trot out the Clancy Brothers, the Chieftains, the Dubliners, the Irish Rovers, and (of course) Bing Crosby for a week or so before what we call (in our house, at least) the High Holy Days. Now, don't get me wrong, I like bagpipes. The Shannon Rovers are perhaps the most famous Irish pipe bands hereabouts; various members of the Curmudgeon family are acquainted with several members of the group. But, as I've told one member of that group, the only thing better than 30 minutes of bagpipe music is 15 minutes of bagpipe music. Like Brylcreem... a little dab'll do ya. 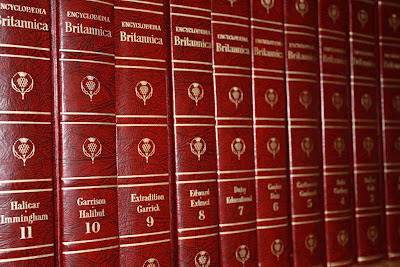 A Chicago-based institution, Encyclopedia Britannica, will stop publishing books; from now on the encyclopedia will be all-digital. I like the Internet as much as anyone -- I like it too much, perhaps, at least judging by the time I spend online when I might be doing other, more productive things. Jorge Cauz, Encyclopaedia Britannica's president, is quoted in the linked Chicago Tribune story as saying, "We're not looking at this as a nostalgic, sad moment.... It just makes sense, the same way that it made sense to go from three volumes to 10 volumes to 32 volumes. It just makes sense for us to take full advantage of the new technology." But I lament the demise of another set of research books. There is no search engine yet devised that can match the Mark One Eyeball for picking out things that one might not have been looking for initially -- but which prove to be more relevant to the true objective of the search. In other words, search arguments miss lots of stuff. And you can't... wander... on the web the way you can wander in an encyclopedia or digest. Oh, you can jump to another page. You can push the "next blog" button at the top of this page. You can go to the next new entry in your Google Reader. I run down a list of bookmarked pages in Firefox or visit links in my sidebar. 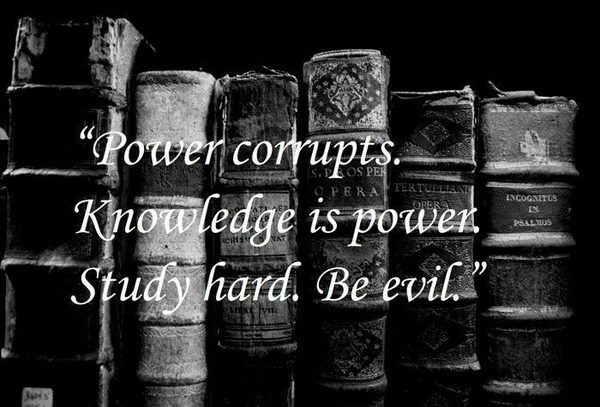 But research books are different. Research has shown that people read a book more thoroughly than a screen. I don't know if the research has taken Nooks or Kindles or other devices expressly designed for reading into account -- but I wouldn't be surprised if researchers find no significant improvement in concentration or comprehension if and when they do. 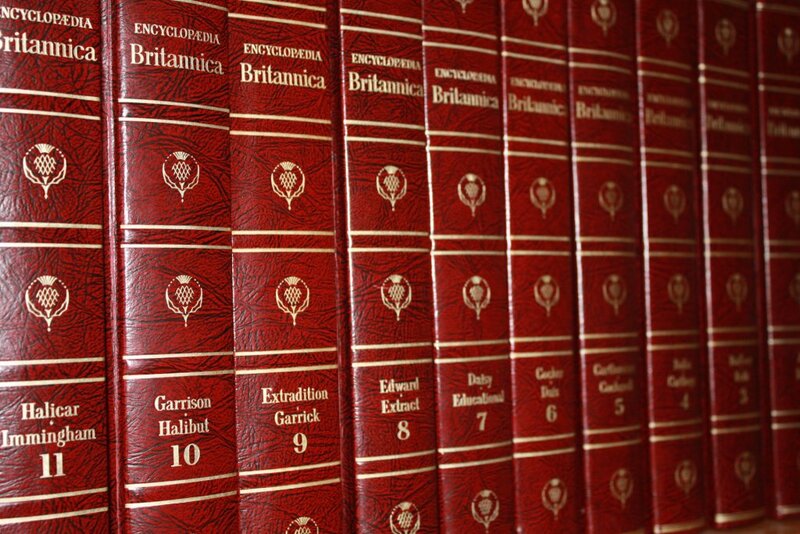 I understand that an encyclopedia volume can become obsolete while it is still in galleys. Science and technology move so fast these days. But I wish there was a way to save the printed page. Isn't that a silly thing to say online? When I was a boy I devoured the Tarzan books of my fellow Chicagoan, Edgar Rice Burroughs. From Tarzan, I graduated to Burroughs' thrilling stories of dying Barsoom, of Captain John Carter and his beautiful Martian princes, Dejah Thoris of Helium. Burroughs could buckle some serious swash. I don't know if I read every single one of Burroughs' Barsoom stories, but I read a bunch, and more than enough to catch the references and bouquets tossed Burroughs' way through the years by later sci-fi authors. And Burroughs inspired scientists, too: Carl Sagan, I learn this morning, had a poster-size map of Barsoom outside his office at Cornell. A few years ago, I bought a compilation of Burroughs' Mars stories from Barnes and Noble and reacquainted myself with the stories. (Barnes & Noble will sometimes repackage and republish books that have finally fallen into the public domain. It took me awhile to figure this out.) I didn't feel cheated. I still thoroughly enjoyed the stories. You can as well, and you don't have to pay for them: Many of the Barsoom stories are now in the public domain and available online for free download to your iPad, Kindle or Nook. I'm not taping any fake arms to my shoulder blades, nor do I plan to at any time in the foreseeable future, but I did watch the commercials for the John Carter movie with great interest and hope. I was encouraged by the fact that a Pixar veteran, Andrew Stanton, was directing. Pixar is another word for quality, as far as I'm concerned. Thus it was that I eagerly opened Roger Ebert's tweet to his review of John Carter last Thursday. And then I was disappointed. Ebert didn't like the movie. He didn't hate it either, but he didn't recommend it. But Ebert didn't change his mind. And it was a busy weekend at home -- shortened by the time change on top of everything else -- and I couldn't get Long Suffering Spouse to come with me to see the show. This morning I hear that John Carter made "only" $30.6 million this weekend, finishing second in the weekend box office sweeps to The Lorax. Because John Carter supposedly had a $250 million budget, this opening is being interpreted as not just disappointing, but devastating. John Carter is being compared to Ishtar in some circles. Well, I still want to see the movie. And I hope it builds at the box office. I'll feel bad about that -- later. 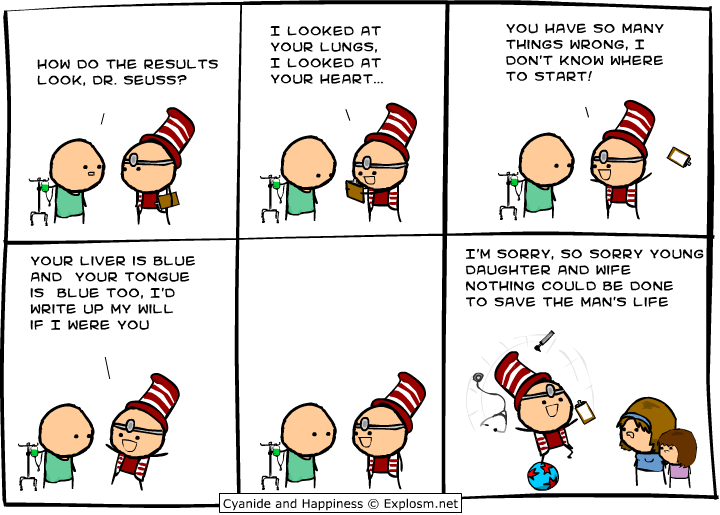 What if Dr. Seuss had really practiced medicine? 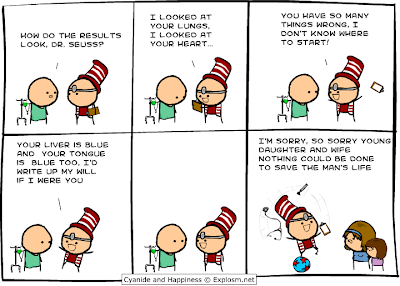 From the webcomic Cyanide and Happiness. Yes, it's a mean way to observe Dr. Seuss's birthday. But, in its morbid way, it's funny. Long Suffering Spouse called me here at the Teeny Tiny Law Office just as soon as she hung up with Younger Daughter and told me the news. "She's on her way here now. With Olaf. When are you coming home?" Oh, my. I had just confirmed an appointment with another attorney. He was coming over to talk to me about... well... about my issues. Situational depression. I'd finally worked up the nerve to reach out for help -- and the nice lady from the agency I'd spoken with had suggested therapy or group counseling as options. But I was not interested in spending more money I don't have -- even at discounted rates. Besides, I told her, I think, under the circumstances, I have every right to be depressed. I just need to be able to talk to someone confidentially, someone who understands the business (or lack thereof). I don't need sympathy. I can get sympathy at home. I need to find a way out of where I'm at before I get into professional trouble. We do offer peer support, said the nice lady. And, over the next several days, as I moved into the Teeny Tiny Law Office, she put me into contact with a volunteer attorney who'd been trained to offer this service. He'd just emailed me that he was on his way to meet me. I couldn't leave. I'll leave my own struggles for another story arc. Suffice for now to say that this latest news had hit me like a slap with a wet newspaper across the face. I got through my meeting as best I could -- this reminds me, I really should follow up on this -- and hurried home. I was the last to arrive. Long Suffering Spouse, Younger Daughter, and Olaf were waiting for me. I admit to being a self-centered egomaniac. But even I had begun to dimly perceive that this news, however shocking it might be for me, would be really tough for Older Daughter. Here she is, trying extraordinary means to have a child, and now, leaving aside all the other problems, her sister, who allegedly was a dead-cinch certain fertility problem, was in a family way. "She knows," Long Suffering Spouse told me. "She knew when we were down in Indy." Apparently Older Daughter had called her sister just when Younger Daughter had first gotten the news from her doctor. Younger Daughter resisted telling her sister anything, but Older Daughter could tell that her sister was distraught and Older Daughter can be quite persistent. Think Chinese water torture. Younger Daughter eventually broke down. "You know, they're going to kill you," Older Daughter said -- referring, of course, to Long Suffering Spouse and myself. "But when they throw you out of the house, you can come down here and live with me." Looking back, Long Suffering Spouse said, there was a verrrry long silence when she had kidded Younger Daughter at breakfast (see Part 4). A pregnant pause, as it were. But there were more important, more pressing questions to ask and tales to tell. Olaf had been with Younger Daughter at the doctor's office. She started crying when she got the news. Olaf said, "We're a family now." There are few better things he could have said. In fact, I can't think of one. Long Suffering Spouse and I had thought for some time that Olaf and Younger Daughter were headed for the altar. We were thinking more like 2013 at the earliest... you know, like, after they graduated from college and found jobs? I poured myself a drink and listened as they discussed advancing their wedding plans. It's easy to be "pro-life" in the abstract. Here, though, was the test. This baby could not have been more ill-timed. It will make it almost impossible for Younger Daughter to find work after graduation (in May). (Thanks for hiring me! By the way, I need to go on maternity leave in six weeks.) Olaf is also supposed to graduate in May -- but he's fallen behind -- he suffers from chronic migraines and we'd been increasingly worried about him (even before this) because the medical treatment he's received has consisted mostly of drugging him up -- preventing him from getting his work done -- and not getting to the cause of his problems. And, even if he does graduate -- and we're still holding out hope -- he's going to have trouble finding a job. The media tells us the economy is blossoming; people looking for work still tell a different story. Olaf is a math major. He will be employable -- but his own health has to stabilize if he's to hold on to any job he gets. Taking on a bride and a child won't make that easier. Just thinking about it gives me migraines. It would have been easier, or some would say it would have been easier, to abort Younger Daughter's and just continue on as if nothing happened. The big church wedding that Younger Daughter dreamed of... getting settled into jobs... learning to live as adults before taking on the additional, and awesome, responsibilities of parenting. And it would be perfectly legal, of course. "It's only the size of a blueberry," Younger Daughter told us that night -- but she had pictures to share anyway. No, there was no "choice" to make here. "We're a family now," Olaf said, and he meant it. "Man proposes and God disposes," my mother used to say. "Humans plan and God laughs," says my friend Steve. I don't know how it's going to work out. I know the wedding's in June. The baby is due in October. I know this won't be the first 8lb. premature baby ever born. I also know that "experts" aren't all they're cracked up to be. The "experts" said Younger Daughter couldn't get pregnant -- and she is. That's a miracle. One doesn't spurn a miracle lightly. Olaf's parents feel the same way. And Older Daughter? Remember? The "experts" told her that she had a 70% chance of carrying at least one of the two implanted ova to term. But that's all over now. It was over days after Younger Daughter told us her news. I've cried for both of them. For what one couldn't do and all that the other must do now. Older Daughter will try again in a month or two, when the doctors tell her it's time. She has mourned. But she is again hopeful. All sorts of people came out of the woodwork to tell her, after the fact, that "IVF never works the first time." She knows what to expect. She knows what to do. And she knows not to put too much faith in experts. Long Suffering Spouse and I are hoping she may even "catch" in the meantime. Because you never, ever know.